Two-time Oscar-winner Cate Blanchett (Blue Jasmine, Carol, Cinderella) joins Marvel Studios' Thor: Ragnarok as the mysterious and powerful new villain Hela, along with Jeff Goldblum (the upcoming Independence Day: Resurgence, The Grand Budapest Hotel, Jurassic Park) who joins the cast as the eccentric Grandmaster, Tessa Thompson (Creed, Selma) who will bring the classic hero Valkyrie to life on the big screen, and Karl Urban (Star Trek trilogy, The Lord of the Rings: Return of the King) who will add his might to the fray as Skurge. Rounding out the cast for the film is three-time Oscar-nominee Mark Ruffalo (Spotlight, The Kids Are All Right, Foxcatcher), reprising his role of Bruce Banner/the Hulk from Marvel's The Avengers and Marvel's Avengers: Age of Ultron. Here's what producer Kevin Feige had to say about these new cast members in a statement. Thor's new cast members join returning stars Chris Hemsworth (Rush, In the Heart of the Sea, Ghostbusters) in the title role for the fifth time; Tom Hiddleston (Crimson Peak, The Night Manager, Kong: Skull Island) as Thor's adversarial, adopted brother, Loki; Golden Globe and Screen Actors Guild Award winner Idris Elba (The Dark Tower, Luther, Beasts of No Nation) as the Asgardian sentry, Heimdall; and Academy Award-winner Sir Anthony Hopkins (Silence of the Lambs, Nixon, Hitchcock) again portraying Odin, Ruler of Asgard. In addition to these casting announcements, Marvel has also unveiled new concept artwork from Thor: Ragnarok, which you can check out below. Marvel hasn't confirmed any story details thus far, but this movie has been rumored to take both Thor and Hulk on a "cosmic road trip," after the villainous Hela banishes Thor from Asgard. 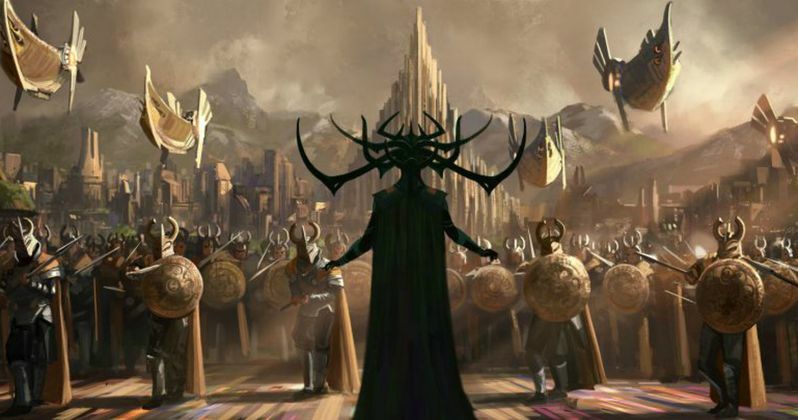 While we wait for more on Thor: Ragnarok, take a look at the new concept artwork below.